Nature-friendly, pigment printing allows to extract all CMYK colors and replicate identical image on linen. We use rail meters (1,5m x 1m), we can prepare the layout of the image according to your needs. Layout depends on model of the product and positioning of the template and the stamp. We offer our own linen fabrics, we have natural (w/o additives) linen with three surface densities and bleached linen with three surface densities. 280g / m2 (suitable for table linens, bags, decorative pillows). 280g / m2 (suitable for table lining products, bags, decorative pillows). Your own fabrics can be used, but if you want to use fabric other than linen – we cannot guarantee the quality of the printing, because our machine is specifically calibrated for working with linen. If you want to use your own linen, its size must be larger for us to be able to prepare the machine for work (minimum length of linen fabric for preparation of machine must be 5 meters. So if you want to order 10 meters of prints on your linen, you will need to provide 15 meters long roll. We will not print on very thick, rough linen. We don’t work with colored linen. Printed fabric can be softened up. For this task we use services of “Jogle”. Be aware that piece of fabric becomes about 7% smaller after softening. Choose pictures that have fewer dark colors, because they might break and have visible distortions after few washing cycles. It is caused by wrinkling and is not the fault of printing quality. Same as belt buckle causing wrinkles to appear on leather belt. If you want your picture to be used as an application – choose the dimensions that would allow placing as many copies as it is possible on rail meter, for example, it is possible to produce even eight pictures from one rail meter. We accept .lpg, .tif, .pdf file format. Send them to [email protected] or use our “create” option. We provide layout design services. Before printing the file, we can send you a preview. We are able to make all our products with your individual design. Wholesale prices, when you are ordering more than 20 pieces of each product. You can visit our printing house in Vilnius, Savanoriu av. 178F. 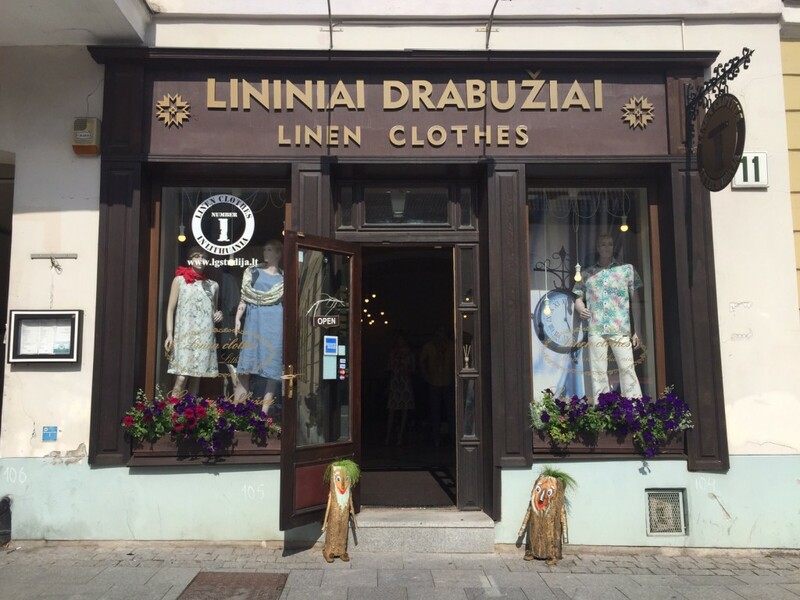 "Linen and Amber Studio’ is one of the most stylish and prestigious amber, linen and gift stores chain in Lithuania, comfortably situated in Vilnius Old Town. It is not at all accidental that we have chosen the heart of the Old Town - a city center rich in history - which since the ancient times gave home and place to craft workshops, shops, merchants' houses and mansions of the nobility. Today we are aiming to restore it. While wandering around the streets and the squares of the Old Town, you can feel the old spirit of the city flowing. Whilst visiting the authentic buildings or their fragments, do not hesitate to get a nice souvenir to remind your stay here in Vilnius and some relevant gifts to share with your friends and family along with the memories of this visit.